People who feel powerless sleepwalk through opportunities, view change as threatening, and hide behind obstacles. Powerless people use things they can’t control as reason to reduce effort, pull back, or quit. People who feel powerful bring energy, skill, and openness to opportunities. Optimism comes to mind. I’ll go so far as to say that feeling powerful is necessary to view problems and challenges as opportunities. Feeling powerful leads to vitality and productivity. Dependency leads to hesitation, anxiety, and discouragement. Power feels like confidence, satisfaction, and optimism. Feeling powerful energizes tomorrow’s effort. Successful leaders create environments where people find, enjoy, and use their power in responsible ways. The best way to feel powerless, stressed, drained, and discouraged is to focus on things outside your control. Give qualified people control over their work. Ask people about times in their lives when they felt most powerful. Expect people to live up to their abilities. The more power you exert, the more dependent others feel, unless you use power to make others feel powerful. 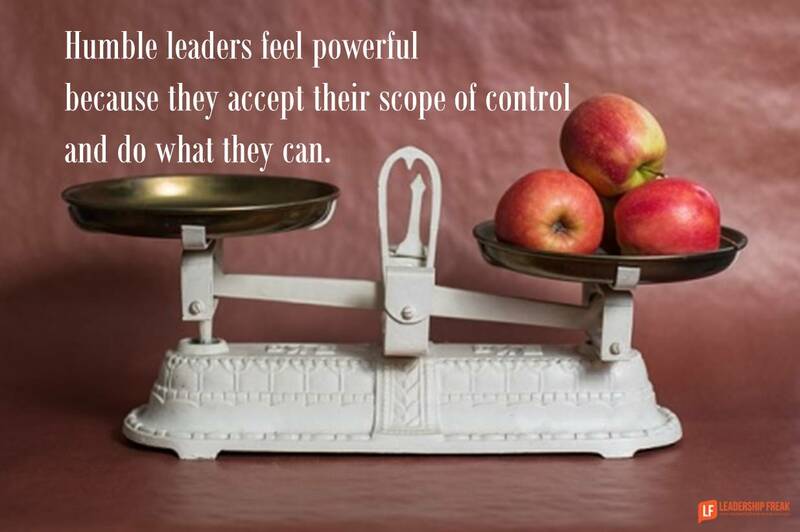 Humble leaders feel powerful because they accept their scope of control and do what they can. Arrogance, on the other hand is safe. It always has something outside its scope of control to blame for failure. Arrogance disempowers by overestimating one’s scope of control. It takes authentic courage to let go of what you can’t control and own your power by focusing on things you can do. How might leaders help team members enter into their power? What leadership behaviors drain power from others? Leaders need authenticity. It helps them to discover power in others. This is the way leaders help team members. Opposite drains energy. When authenticity takes back seat, it starts diverting efforts. Leaders integrate team synergy. I appreciate your point that feeling of powerlessness leads to anxiety and discouragement. It is also true that powerless people try to have control over petty things. They try to create chaos in the system. And when they do so, they feel powerful. Leaders should ensure that chaos should be minimised and proper processes should be implemented. I have seen beautiful strategy and plans on paper but when it comes to execution, it falters. Empowerment is individual feeling which everyone should accept it. The moment people start looking for it, it misses its essence. GREAT ASSESSMENT OF EMPOWERMENT IN A NUT SHELL! You said and I agree, “People who feel powerless sleepwalk through opportunities, view change as threatening, and hide behind obstacles. Feeling weak squanders usefulness…” The entire article captures the essence of empowerment; the above statement distills it. Good job Dan!! .